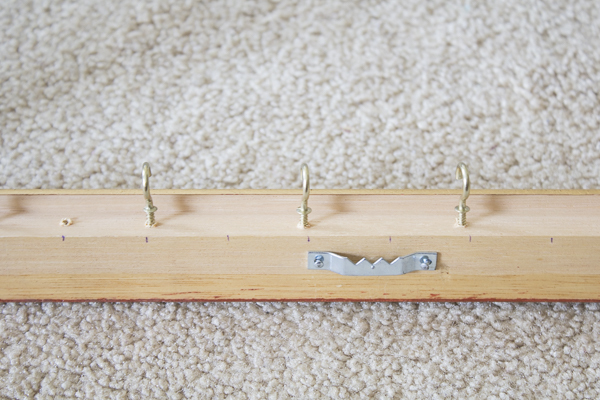 The following is a guest post on creating a DIY necklace holder from regular contributor, Yuni at Love Your Abode. If you like accessories as much as I do, this post is for you! A while back on my blog, I shared about how I keep my jewelry organized in my bedroom. 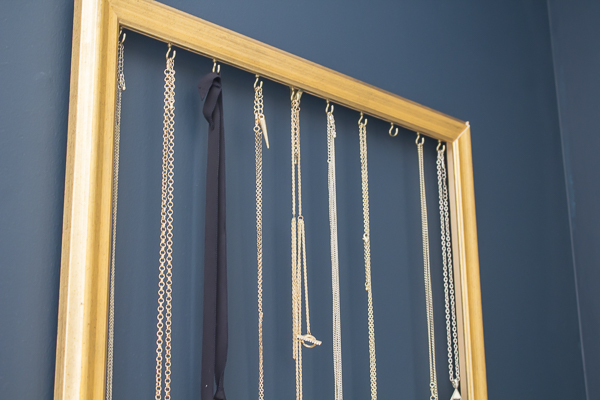 Today, I’m sharing a simple DIY project to help you organize some of your necklaces. Recently, a bunch of vintage necklaces were passed down to me from family members. One day, I’ll get to pass them down to my daughters. Until then, I really needed a way to organize them but I also wanted to be able to see them displayed in my bedroom. I came up with this idea because I already had most of these supplies on hand. You only need a few inexpensive items to put this together and I believe anyone can do it. This would also make such a great Christmas gift for a family member or friend as it’s not only practical but a beautiful way to display your jewelry. Gather your supplies and get out that measuring tape and pencil. 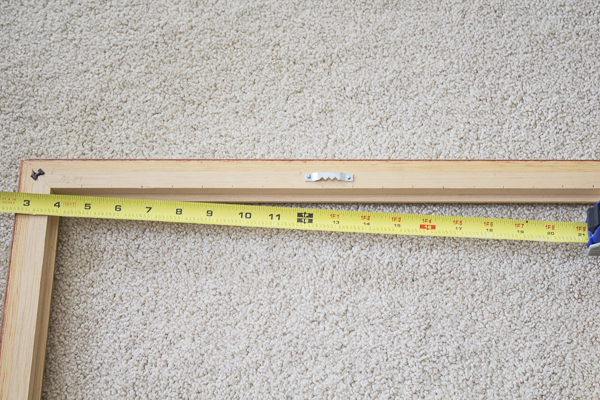 Measure the length of your frame on the top. Find the center and nail in your sawtooth hanger if your frame is missing one. This will allow your frame to hang on the wall. I made marks on every inch along the frame. I decided I wanted my necklaces 2 inches spaced apart so I made holes for every other mark. Get out that skinny nail and hammer it in just so you get that first hole. This will make it easier for your cup hook to go in. Place the cup hook in the hole and just screw and twist it in by hand. So easy! 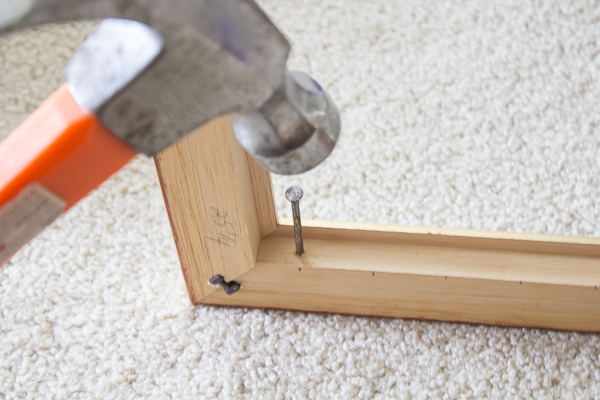 You don’t want to screw it all the way in because then, the hooks will be hidden underneath the frame. I screwed in the hooks all across the frame along the penciled marks. I ended with 10 hooks for my frame. 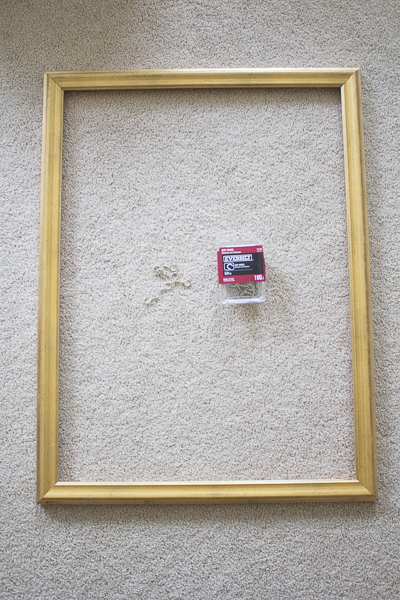 Hang up your frame against a picture hook and voila! You’re all done. 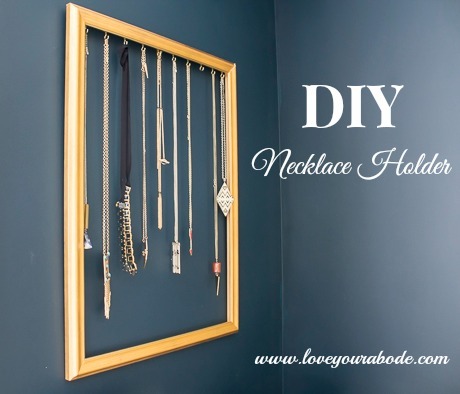 Hang up your beautiful necklaces and now, there will be no more tangling messes on your dresser. Oh, was that just me? 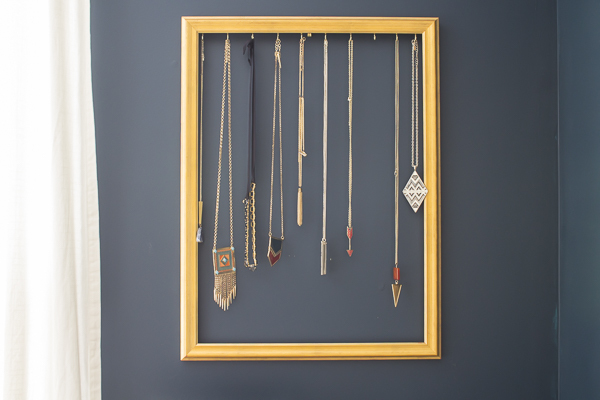 Try to find a larger frame so that it’s long enough for your necklaces. I love mine and the gold frame is so pretty against my navy bedroom walls. 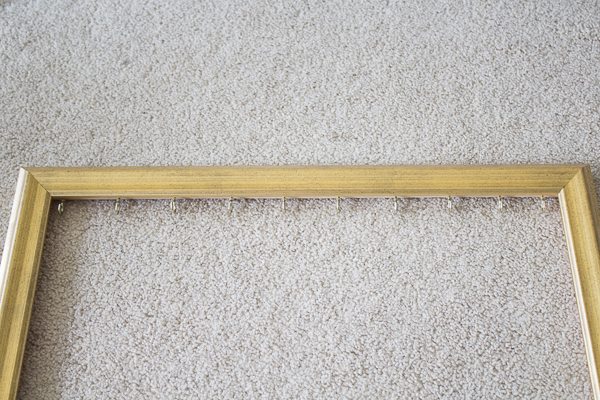 This is one of the most simple DIY projects you can do so I hope you’ll try it out. If you make one, be sure to share it so I can see the result!